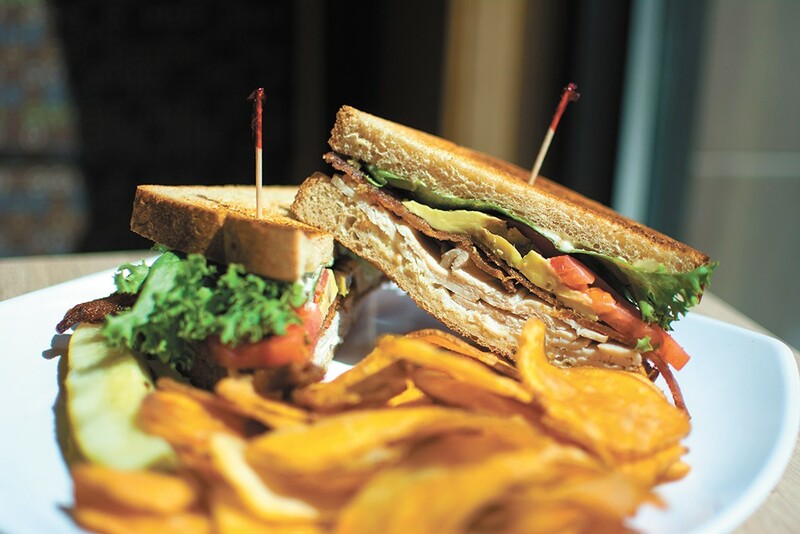 Fresh-made sandwiches are just one of Clark Fork's many offerings. In just a few weeks, thousands of students will return to Gonzaga University's campus east of downtown Spokane, which means tables at the new Clark's Fork restaurant across Hamilton Street will soon bustle with not only busy families and the weekday lunch crowd, but studious undergrads, too. The new eatery opened just after the final days of GU's spring semester classes, so students who've been away since then can look forward to the new local option for healthy and fresh café-style fare, and breakfast served all day. Clark's Fork is the second Northwest location for the Bozeman, Montana-based chain owned by Jeff Riggs; he has plans to expand across the region. Its name is indeed a play on the Clark Fork River, and also a nod to Lewis & Clark's expedition of the Corps of Discovery that unveiled the scenic landscapes and natural bounties of the western U.S. from 1804 to 1806. Artwork around the restaurant fittingly features passages from Lt. William Clark's journals from the trip referencing food and mealtimes. An outline of the Clark Fork River, a major tributary of the Columbia that flows more than 300 miles through Montana and Idaho, is stained onto the cement floor. "Clark was the more culinary-explorative of the two, so those storyboards are direct quotes from his journal for areas he found around here," explains restaurant manager Mike Musser. "We want customers to see our brand as an exploration, or to try something new," he adds. In addition to a menu of numerous breakfast items, as well as deli sandwiches, grass-fed beef burgers ($8.50), rice bowls that can also be made as wraps ($8.95-$10.95) and a special kids' meal ($4.95), the highlight, perhaps, is a fresh salad bar with more than 50 ingredients and counting. Complementing the salad selection ($5.95/small, $7.95/large; one trip each) is the housemade soup bar ($4.50/cup, $6.95/bowl). Musser says it's his goal to get the number of salad toppings closer to 100, making it the biggest and most diverse in town. The challenge, though, is finding regional producers to provide those ingredients, a focus of the Clark's Fork brand. Customers will thus find coffee roasted over in West Central by Indaba, loose-leaf teas from Spokane's Winterwoods Tea Company and ingredients from numerous other regional farms and producers. They won't find local beer or wine; Clark's Fork doesn't serve alcohol. In keeping with its casual and welcoming atmosphere, diners at Clark's Fork order at the counter, standing atop a big compass etched into the floor, and servers bring their food out to a table, or in to-go containers. To accommodate its diverse customer base of students, families and professionals, the café's dining room seats nearly 100, with an open floor plan and a kids' play area, as well as some more secluded seating around a corner for those looking for a quieter visit to work or study, Musser says.